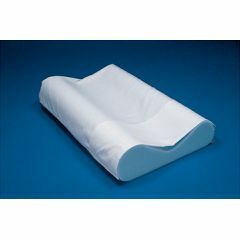 Our most economical foam cervical pillow. The Core’s Basic Cervical Pillow is designed to soothe your tired neck and back and support your neck in its most natural position during second and third stages of the TriCare Circle of Health: Correct and Maintain. During the active treatment, or Correct stage, the pillow helps improve the curvature of your neck helping promote the healing process. Alleviates tension headaches, neck pain and the discomforts of arthritis and other ailments. Good cervical pillow. My pain is better. Easy to Control. Attractive Design. Comfortable. Multiple Positions. Solid Construction. Comfortable. Fantastic product. Easy to Control. the choice of raised sides allows for multiple use.